Incident Details: A lady walking with a family member, slipped on an icy path above Taylor Gill Force, and took a tumbling fall of 20 metres into a scree field. She suffered serious head injuries. Her son ran down to the farm to raise the alarm. 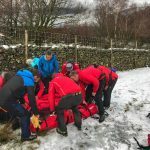 The Team set off to Seathwaite with a Landrover full of personnel, whilst other Team members followed in a Sprinter, and Search Dog handlers training in the valley went direct. Control checked on the availability of air support, given the reported injuries. The casualty was in an awkward location, (see picture) so a request for a winching Coastguard helicopter was made. Fortunately, the Great North Air Ambulance was able to attend fairly swiftly, and the medical crew were deployed to assess the patient. After preliminary treatment, she was winched aboard the Coastguard helicopter for to transfer her to the Preston Royal Hospital for treatment, accompanied by the doctor from the air ambulance. The Team stood by until the aircraft was airborne, and then stood down. 17 Team members – 3 hours 22 minutes.